Pre-school Storytime for children ages 2-5 on Thursday mornings April 4, 11, 18, and 25 with Miss Jill at 10:30 am. Children will participate in reading, singing, rhymes and fun crafts. Children under 3 ½ will need a parent/caregiver present. Storytime for School Age Children on Thursday mornings April 4, 11, 18, and 25 at 10:30 am. Miss Amy will organize a variety of activities for children ages 6-10. Expect stories, crafts, Legos, games, and more! 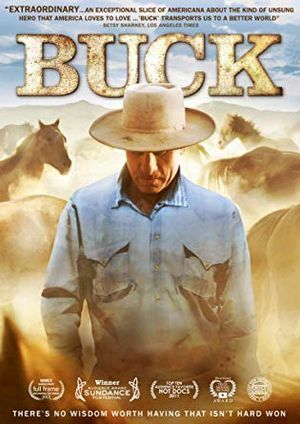 Great for homeschooling families! All ages will enjoy this meet and greet session with our friends from the Zoo! 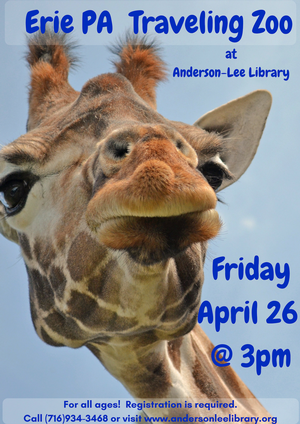 Come get a close up view of a variety of animals. You can even touch some too! Please register so we can plan for enough seating. 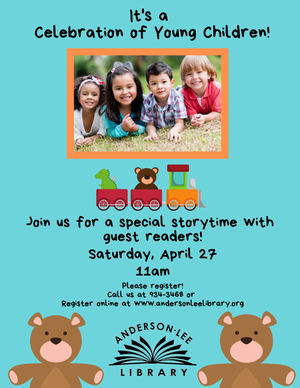 With special guest readers Jeff Hornburg, Mayor of the Village of Silver Creek, and Virginia Miller, Assistant Director of Lake Shore Family Center. Join us for stories and a craft to celebrate young children! 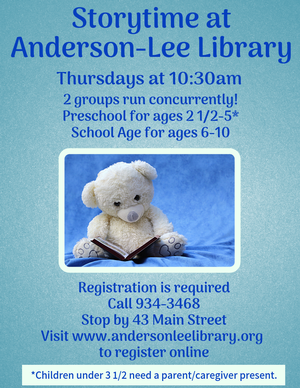 Pre-school Storytime for children ages 2-5 on Thursday mornings May 2, 9, 16, 23, and 30 with Miss Jill at 10:30 am. Children will participate in reading, singing, rhymes and fun crafts. Children under 3 ½ will need a parent/caregiver present. Storytime for School Age Children on Thursday mornings May 2, 9, 16, 23, and 30 at 10:30 am. Miss Amy will organize a variety of activities for children ages 6-10. Expect stories, crafts, Legos, games, and more! Great for homeschooling families! For families of all ages, this matinee will offer new releases, old favorites, and seasonal fun! 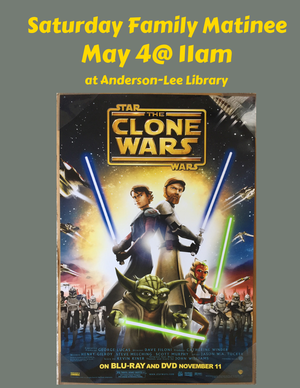 Bring a bag lunch or a snack to enjoy while you watch “The Clone Wars” (pilot movie for the tv series). 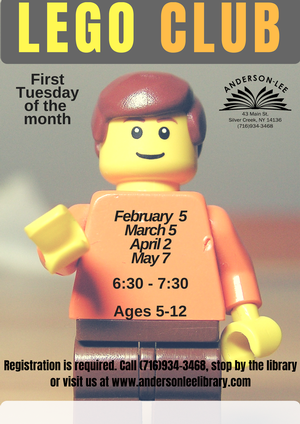 Lego Club meets the first Tuesday of the month at 6:30 pm. Ages 5-12 are welcome to join us for our monthly building challenge. Registration is appreciated. 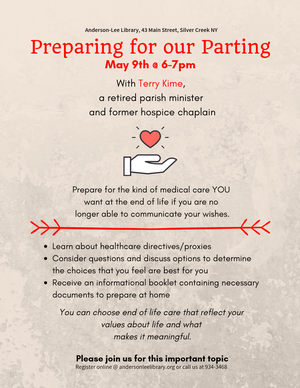 Prepare for the kind of medical care you want at the end of your life if you are no longer able to communicate your wishes. Learn about health care directives and proxies. Consider questions and discuss options to determine the options that you feel are best for you. Receive an informational booklet containing necessary documents to prepare at home. Mine Craft Club meets on the second Tuesday of the month at 6:30 pm. Kids age 6-15 are invited to join us as we cooperatively play, build, craft, explore and create! We’ll be focusing on survival mode and playing together on the library’s network. 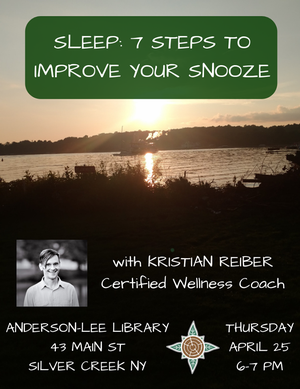 Registration is limited to 8 participants. Please note that December's program will start at 6pm. Meets the third Tuesday of the month at 7 pm. 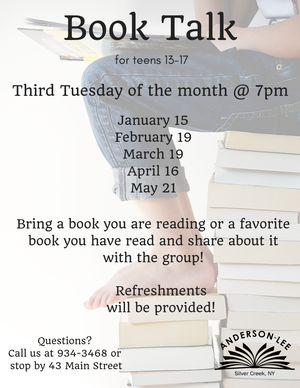 All teens age 13-17 are invited to bring a book they are reading or have read and share it with the group. Refreshments are provided. In January the club with meet on the 15th. 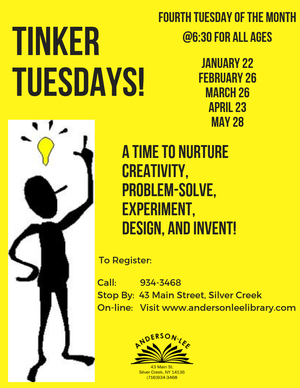 Tinker Tuesday meets on the fourth Tuesday of the month at 6:30 pm. All ages are invited to tinker and build with a variety of materials.